Playa del Carmen offers a unique and wonderful opportunity to interact with nature in a safe and eco-friendly way. This collection of dolphin swimming activities is famed around the world for it's excitement and special memories that it creates. 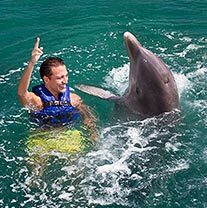 We have Playa del Carmen dolphin swims for all ages - infants to adults - all swimming abilities, and all budgets If you've never done it, do it here! THE BIGGEST SELECTION OF PLAYA DEL CARMEN DOLPHIN SWIMS! SAVE UP TO 45% ON DOLPHIN SWIMS WITH SUPER COMBOS! Royal Dolphin Swim - The most popular dolphin activity in Playa del Carmen. Includes high-speed action of the foot push and dorsal tow. Dolphin Swim Adventure - An entry level swim, includes a fun belly ride. Dolphin Encounter - Perfect for small kids and people who don't swim. You do the interaction on an underwater platform rather than in deep water. Sea Life Discovery Plus - An awesome combination of dolphins, sea lions and manatees. This is the best activity, includes the Royal Dolphin Swim and more. Delphinus Primax - The most time in the water with the dolphins except for the private swim. Includes the foot push, but not the dorsal tow. Private Dolphin Swim - One trainer, one dolphin, one hour. The most personal and intimate of all, and the most dolphin interaction of all. Also next door to Xcaret, which makes it a good add-on to your Xcaret tour. Xel Ha Dolphin Swims - Only for people who want to spend the day at Xel Ha, because you have to pay the admission fee in addition to the dolphin swim. Xcaret Dolphin Swims - Same as Xel Ha, you have to pay entrance to Xcaret as well as the dolphin swims, but if you're planning to visit the park anyway, this is a great add-on. Dolphin Trainer for a Day - The ultimate dolphin immersion. Spend all day with dolphins, learning how trainers do their job and getting to walk in their shoes for a day. Includes the Primax 4 activity too! * Prices shown depict the maximum Early Booking Discount of 25%. If you book late then the pricing may vary. All dolphin swims include transportation. The Dolphin Encounter is the only activity that doesn't take place in deep water where you're actually swimming with the dolphins.